You know the saying, "Life is what happens when you are busy making other plans"? Life has certainly happened around here. Very unexpectedly, I have found myself in a long term substitute teaching assignment! I have been in this class for the past three weeks and will be there until the end of the school year. Most surprising to me, is how much I am enjoying teaching in a grade school. If you would have asked me nearly 25 years ago, if I'd ever use the Spanish and French classes I was taking in high school and college, I probably would have laughed. I certainly never expected to be teaching Spanish vocabulary to grades K-5! My plan continues to be earning my Masters in Education with a certificate in Secondary English/Language Arts. Part of me wonders, however, if maybe I ought to change it to elementary education. I really wish I could stay on as the Spanish teacher. It is more fun than I imagined! One thing is for certain, I do know I want to teach. 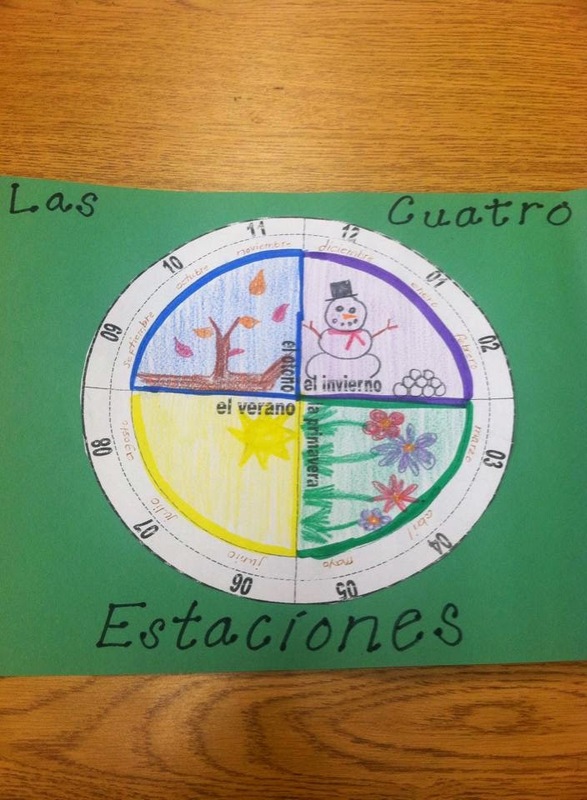 At the end of our unit on seasons and weather, the students put together this project I found here. Part of our unit even included listening to "Verano" from the Frozen soundtrack. Next, we tackled El Cuerpo. I was inspired by the Roll a Monster project. Students in small groups, created their own monsters. 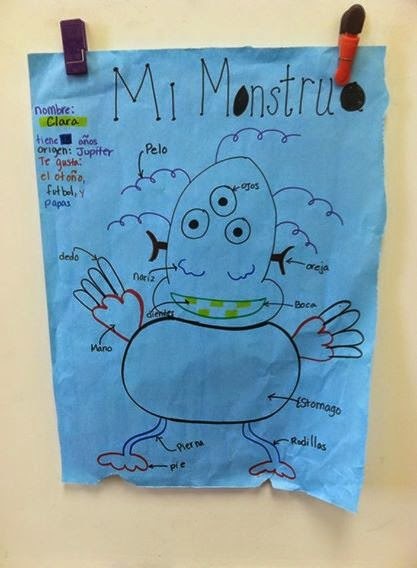 The students had to name their monsters, give it an age and tell where it was from. In addition to the basic statistics, the kids had to list three things their monster liked. When it came to drawing the monsters, each group had to label a certain number of body parts. The kindergarteners and first graders did the project a bit differently. I called out a color, number and body part in Spanish and they had to draw it on a blank piece of paper. We also sang several songs including Mi Cuerpo Hace Musica and Cabeza, Hombros, Rodillas, Pie. The older kids were less than impressed with the songs, but that sort of goes with the "almost out of grade school" territory. This week, we are learning Classroom Objects. And next week, we are doing an Artist Study Unit on Picasso. That should bring us to the end of the school year. Phew! Just in time for me to start my graduate classes!